I've been using the Sigma Professional Makeup Brushes for 8 months now. I've washed them many many times and have used them everyday, so this review is long overdue. Sorry to those who asked me to review them since then. Almost all of these brushes have different names & numbering now, which I'll write in brackets. SS150 (F30) Large Powder Brush ~ For powder application. It's very soft. But it sheds a little, although it's not really an issue for me. Hey! The hair on my head sheds everyday so... =D. 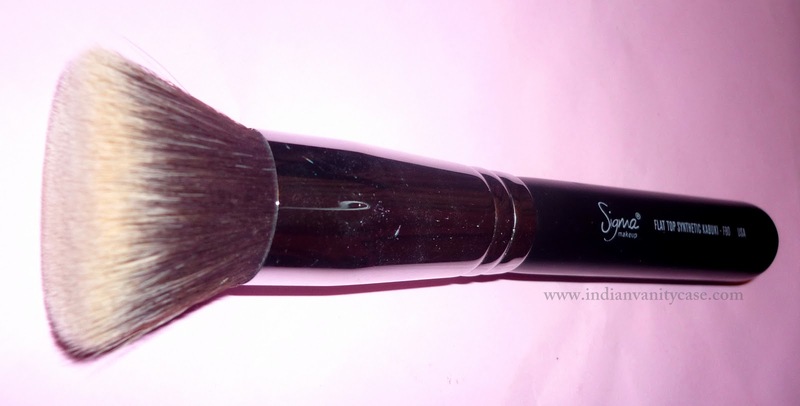 SS187 (F50) Duo Fibre Brush ~ For Foundation, powder, blush. I can't live without this. The cons about this it's not as stiff as I'd like it to be. It splays way too much sometimes. BLEEDS while washing & sheds a little too, so I have to remove pieces of bristles every time I use it. SS166 (F40) Large Angled Contour ~ I don't really like this for contouring, coz it's a little too soft, but I like to use it for applying blush. SS190 (F60) Foundation Brush ~ This is a good foundation brush, but I've used a Vega one that is as good too. SS194 (F70) Concealer Brush (6th from top in the pic down there)* ~ Not bad, but I prefer using my fingers to this or the SS224 (E40) below. SS224 (E40) Tapered Blending ~ This is one of the best. Great for blending eyeshadows & for applying and blending concealer too. SS239 (E60) Large Shader ~ I use it for cream eyeshadows. It is a must-have brush if you like to use pigments and glitter. SS275 (E70) Medium Angled Shading ~ This is a must-have for doing smoky eyes, specially is you're a novice at applying eyeshadow, coz it makes it easier for you to shape your eyes. 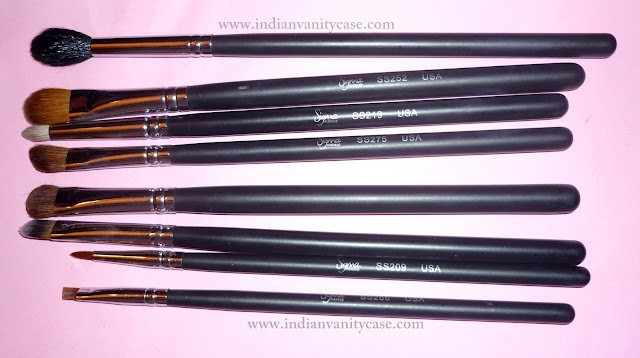 SS230 (E55) Eye Shading ~ This is great if you want to pack on color on your lids coz it picks up a lot of eyeshadow. I use it for blending too. SS266 (E65) Small Angle ~ This is a nice angled brush for applying gel/cream eyeliners, but it's hard to get a thin line and to wing at the corners with it. I use it mostly for tightlining. I'm positive you'll find a better one out there. F80 Flat Top Kabuki Brush ~ This is my favorite brush of all. I use it for almost everything! Foundation, powder, blush (powder/cream), bronzers. I wouldn't mind using it to apply my moisturizer too if it's clean =D. It's super dense and gives a flawww....less finish. If you're on a budget and can get only ONE Face Brush, get this one. These are two of the most useful freebies I've ever received. My makeup routine is incomplete without them. Amazing blending brushes, and you can use them to smoothly apply all over color. Plus, like like that they're short, which makes them very easy to handle. I hope you found this review useful if you're thinking about ordering these brushes. In case I missed to mention something, feel free to ask me any questions. About prices, please visit the Sigma website. Yup really good. I want some Mac ones but gosh they're so expensive! Hehe...and thanks for entering my giveaway, Cynthia! Good luck!! I think I am really happy with my MAC 239 and 217 brush. 219 and 224 is dupable. I am glad I have those, but I don't like a holiday set I received as a present. I mean, they do the job, but the quality is a downer. yeah the short handle ones. Don't buy them, not worth it. the handles are poor quality and break off. But they are great for travelling but I guess the normal sized sigma ones are probably cheaper. 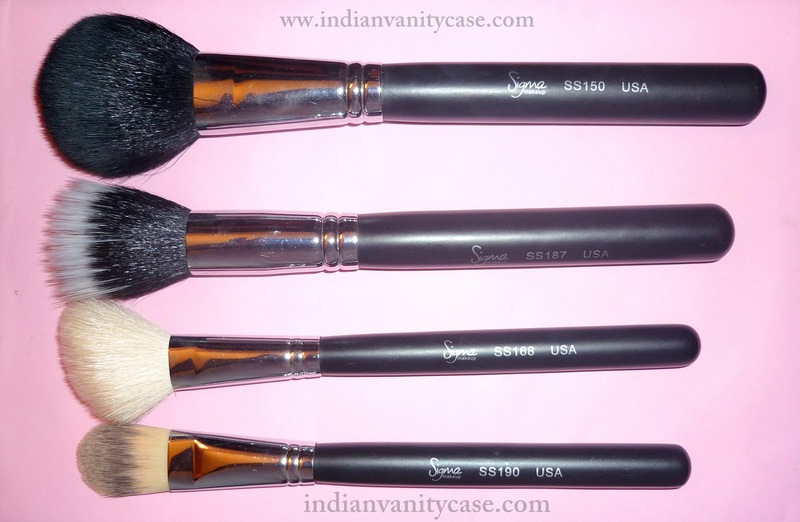 Thank you so much for the much awaited review Cynthia..I have shortlisted a few from your reccos to buy from Sigma..Aiming mostly for E/s brushes..
those are some really awesome blushes !! !